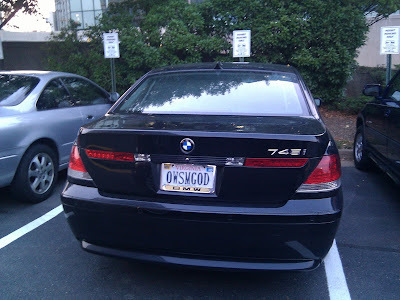 This is Ahmed's Oracle Fusion Middleware Blog: OWSM God spotted in Virginia! OWSM God spotted in Virginia! As I was parking at the gym last night, I came across this. Apparently the OWSM God lives in Virginia! For those who don't know, OWSM means only one thing... Oracle Web Services Manager. OWSM provides security, policy management, and monitoring of your services. It can provide authentication, authorization, and encryption of your web services. I've used it on a few projects. One global customer required the messages between their U.S. and European data centers to be encrypted. Another customer required it to secure the services between their internal systems and external partners. A third customer implemented it, and later on removed it, because it resulted in a 15% performance hit which they could not afford at the time.